Grab your sonic screwdriver and ready the TARDIS, because for the first time ever in Doctor Who history, the American audience will no longer have to wait to see the annual Doctor Who Christmas special. 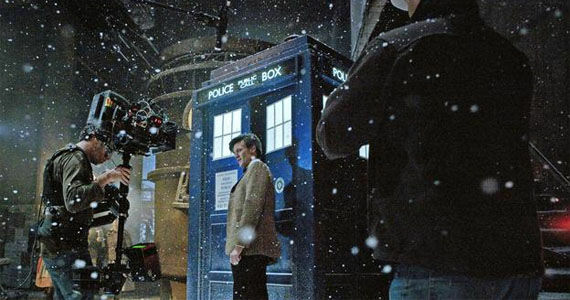 Starting this year, BBC America will air the always-anticipated holiday installment of our favorite time traveler on Christmas Day, the same day that it airs in the UK. A move such as this was almost certainly fueled by the rabbid American audience resorting to Torrent sites for their Doctor Who fix, instead of waiting for the special to air on television. In theory, simultaneous airing should help boost the ratings of the special on BBC America and provide an even greater representation to the BBC of the immense fanbase that the series has across the pond. One cannot hear “A Christmas Story” in the same sentence as Doctor Who without thinking about the possibility that we'll be taking a look at the past, present and future of the Doctor. Of course, being that a story of that magnitude would be extremely costly and hard to pull of, it's more likely that the Doctor will use the TARDIS to present a particular unfriendly character with various moments of their life. Fortunately, we won't need to speculate much longer on what Doctor Who's take on “A Christmas Carol” may or may not entail. On Friday, the BBC will hold their annual Children In Need special and as always, a preview of the upcoming Christmas special will be included. We will have the preview available shortly after it airs. In other Doctor Who news, filming is currently underway in America. After a memorable appearance on The Late Late Show With Craig Ferguson (see below), Matthew Smith flew to Utah to begin shooting scenes that will be included in an American story-arc for next season's premiere. Accompanying the Doctor and Amy Pond stateside is the always lovely Rivers Song (Alex Kingston) and Supernatural alum Mark Sheppard (Crowley) as Canton Everett Delaware III. While nothing else has been revealed about Sheppard's character, one can only expect his performance to be wonderful.